Located right next to Heian Jingu Shine. Okakita is really famous for offering authentic Udon and Soba of Kyoto and loved by locals and foreign visitors. All ingredients are carefully chosen in order to provide the finest dishes for us. Their Udon need to be boiled for 10 minutes or 15 minutes, because the texture of noodles are changed according to the temperature day by day. Over 15 noodles menus are available. Ten-toji (tempura is cooked with egg) Udon is really Kyoto style. Soft Udon noodles get more delicate taste due to natural kelp extracts soup. 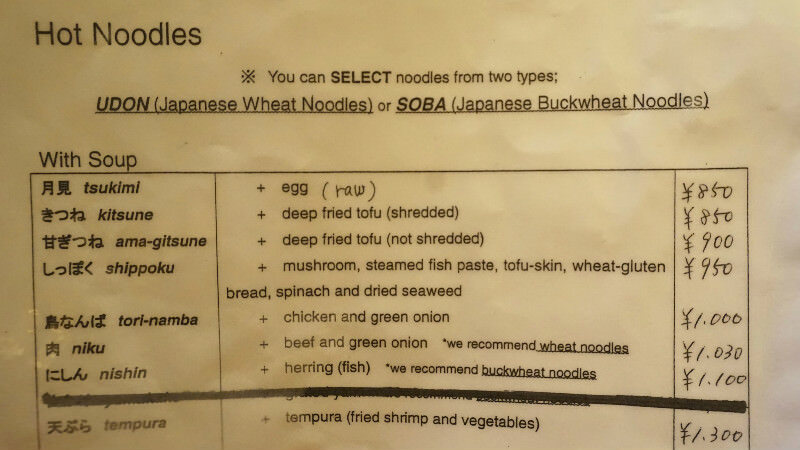 All Udon menus can be changed to Soba instead. So many customers are always in a queue before the restaurant which is open at 11 a.m. So we highly recommend that you arrive at 30 minutes before the opening. You would enjoy smell of kelp soup stock being in a queue! 2 big shrimp tempura in the soup. Since the soup is mixed with egg, you will drink it up deliciously! The texture of Udon is thin and really soft and you can slurp easily even if you have never done before. Come here, beef eaters! This is exactly you should eat if you would like to eat all kinds of beef dishes. The fat of it will be melt down in your mouth as you eat it! Its extract goes well with the soup. A bit sweet boiled beef is great with sliced Japanese leaks. Try to change the taste of it by peppers that are on every tables. The soup with Tofu and Yuba (Soybean card). It looks so salty but it is really delicate. you can also have a smaller amount for ￥280. Notice: All rice bowl dishes come along with it. All noodles menus can be selected from Udon or Soba and Hot or Cold. I really like Okakita Udon! They start boiling Udon for your dish after you order so that you can eat the finest dish. Although there are so many customers in a queue every day, the staff of the restaurant makes you relaxed and provides homely and cozy atmosphere. Their dishes look so mouthwatering that a camera must be needed. This is the Udon restaurant we highly recommend you stop by if you visit Heian Jingu Shrine. the soup of Ten-toji Udon that is well mixed with egg, is really good. There are a lot of visitors in a queue on high seasons. However, It is worth eating! 2-minute walk from city bus Dobutsuen-mae stop getting off. There are Japanese and English menus in the restaurant and all staffs speak basic English so you can enjoy without language problems.